The peak nation­al organ­i­sa­tion rep­re­sent­ing the Aus­tralian graph­ic design indus­try. With more than 2,600 mem­bers through­out the cre­ative sec­tor, it’s ded­i­cat­ed to advanc­ing the pro­fes­sion through an inter­re­lat­ed pro­gram of state, nation­al, and inter­na­tion­al activ­i­ties in edu­ca­tion, advo­ca­cy, and pro­fes­sion­al devel­op­ment. 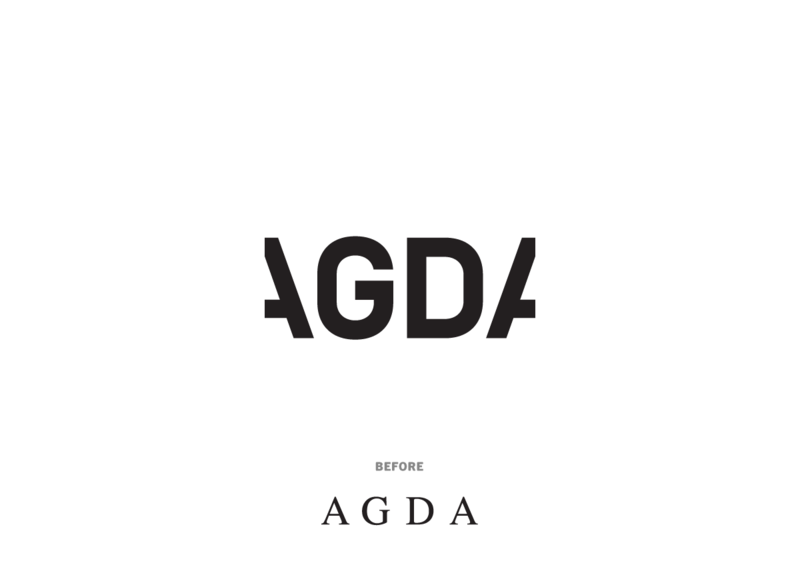 To change the per­cep­tion and feel­ing around AGDA—from an asso­ci­a­tion per­ceived as behind, cor­po­rate, and closed off, to one ful­ly open to new tech­nol­o­gy, new oppor­tu­ni­ties, new ideas, and of course new mem­bers. It also need­ed to be open to new disciplines—such as dig­i­tal design, motion design, writ­ing for design, and brand­ing. AGDA is the con­nect­ing force that unites our indus­try. It cel­e­brates the things that make us dif­fer­ent and the things that pull us togeth­er. The per­fect bal­ance between uni­ty and diver­si­ty. The logo con­nects at either end, rep­re­sent­ing a chain-link of the indus­try com­ing togeth­er. The idea was to keep the core brand ele­ments time­less; to resist the urge to make the iden­ti­ty too trendy or cool. That way, there is space for dif­fer­ent design­ers to be more expres­sive around the logo and typog­ra­phy, while the core ele­ments remain for years to come.